Average Joes is a new Terror Network scenario-supplement. Unlike previous TN adventures, this one allows players to be regular people in extraordinary situations. Written by Reuben Hinman (who wrote Operation Hydra and contributed to the Agency Resource Guide) it contains a compelling one-shot adventure plus rules for running civilian campaigns. 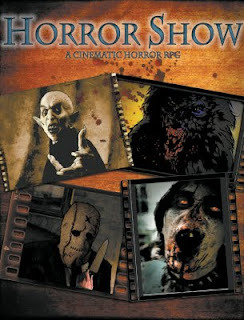 Horror Show is virtually finished. We have the cover art, which I think is some of Jeff Preston's best work. It really captures what we were going for (the entire spectrum of horror films). All that remain are some minor adjustments to the manuscript before it goes to the editor. Orlando's Guide to Organized Crime is still in the final phases of development. The character Orlando (appearing in Crime Network Rule Book as well) was based on my Grandfather Orlando J. Fanti, who passed away in January. The book is dedicated to his memory, but I need to make sure it's perfect. The other project in development doesn't have a name yet, but it is our first venture into fantasy. We've taken the core Network System and reworked it to include magic and to fit the genre. If you like magic, you will love this game. We created the core concepts over the last year, and now we're ready to dive into the writing. Because it will include a setting, spells, monsters, rules, characters and more, this will also be a larger book than Terror Network, Horror Show or Crime Network (probably around 200 pages, possibly more). We like keeping things concise and to the point, but with a fantasy RPG we simply had to give ourselves more room. Patriot Incident is out in PDF (RPGNOW) and available for pre-order in print (Studio 2 Publishing). It's a great investigation adventure, and anyone interested should check out Tommy Brownell's review (Most Unread Blog).